Everyone jokes about the 20/20 hindsight of cost management. In Life-Cycle Costing, Jan Emblemsvag proposes to do something about it. Here's a new approach to life cycle costing that brings activity-based costing, risk, and uncertainty into the forefront. You'll focus on future costs and learn how you can perform any type of cost management activity better than before by introducing uncertainty into models and exploiting them to the max. JAN EMBLEMSVÅG is a management consultant with Det Norske Veritas Consulting, where he works on cost management, risk management, and business development projects. Formerly, he was a partner with Considium Consulting Group AS. He is coauthor, with Bert A. Bras, of Activity-Based Cost and Environmental Management: A Different Approach to the ISO 14000 Compliance. 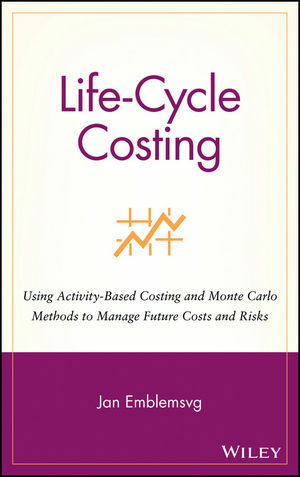 The Role of Life-Cycle Costing. 2. Basics of Life-Cycle Costing. 3. Uncertainty Analysis and Risk Management. What are Risk and Uncertainty? Common Ways of Analyzing Risk and Uncertainty. How Belief Sheds Light on Risk and Uncertainty. Reduce Risk by Introducing Uncertainty: How Monte Carlo Methods Work. ABC Example and Case Study. Step 1: Define the Scope of the Model and the Corresponding Cost Objects. Step 2: Obtain and Clean Bill of Materials for All Cost Objects. Step 3: Identify and Quantify the Resources. Step 4: Create an Activity Hierarchy and Network. Step 5: Identify and Quantify Resource Drivers, Activity Drivers, and Their Intensities. Step 6: Identify the Relationships between Activity Drivers and Design Changes. Step 7: Model the Uncertainty. Step 8: Estimate the Bill of Activities. Step 9: Estimate the Cost of Cost Objects and Their Performance Measures. Step 10: Perform Monte Carlo Simulations and Relevant Analyses. Further Explanation Regarding Some Steps. 6. Case Study: Life-Cycle Costing and Tire Disposal. What the Decision Is About. 7. Activity-Based Life-Cycle Costing for Platform Supply Vessels. Operating a Platform Supply Vessel. Problem Statement and System Boundaries. Activity-Based LCC Model Implementation and Results. Identifying the Major Operational Risks. 8. Activity-Based Life-Cycle Costing at WagonHo! WagonHo!’s New Strategy and Business Idea. Developing an Activity-Based LCC Model. Results and How to Use Them. 9. From Hindsight to Foresight. Some Thoughts at the End. Appendix A Monte Carlo Simulation Example. Appendix B SFI Group System.